Want your Frisco without the financial uh-oh? 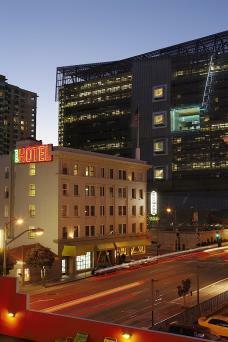 There are hotel steals to be had in San Francisco, if you know where to look. Union Square is considered the most central; it's where you will find the most hotels and, typically, the highest rates. However, the city hosts wallet-friendly accommodations for every budget and taste, from cozy 26-room inns to under-the-radar gems packed with perks. Frugal travelers should know that weekend rates are generally more expensive than weekdays. You really can find great bargains in several San Francisco neighborhoods. This rambling neighborhood - short for 'South of Market Street' - is sort of a museum district with its share of dance clubs and high-rise residences mixed in. You'll find the San Francisco Museum of Modern Art (SFMOMA) here, as well as a number of quality shops and restaurants. SoMa is ideal for the area's walk-to-work entrepreneurs, but that's not to say budget-minded tourists should skip SoMa for lodging. The neighborhood is a great launching point tucked away in the heart of San Francisco near Union Square. Mosser Hotel - Winsome Victorian meets modern sensibilities in this two-and-a-half star budget find, right next to the Moscone Convention Center. Mosser's convenient ocation is perfect for walking to work or play. Many of the simple, diminutive rooms require guests to share hallway bathrooms, so if privacy is important, make sure you reserve a room with its own bath. Comfortable and clean, the hotel's guest rooms have a number of extra niceties, like free Wi-Fi, robes, HDTVs and CD players, which is surprising given the pint-size price. Rates start in the $140 per night range. Good Hotel - Small-priced, big-hearted Good Hotel aims to practice philanthropy beyond just being green. The city's self-proclaimed "first boutique hotel with a conscience," this 117-room eco-hotel packs on the free extras. Beyond complimentary Wi-Fi, guests can enjoy free use of the hotel's bikes and free parking for hybrids, plus fitness room and heated outdoor pool access at its sister property across the street. Rooms are motel-chic and split between a main five-floor tower building and a separate section of courtyard rooms with outdoor hallways. Recycled materials make up much of the stylish décor of this offering by the Joie de Vivre Hotels collection. Healthy living is clearly the focus, as is a dash of hipster and a healthy dose of fun. The result is good for your wallet, with rates from $118 per night. You may think your wallet unwelcome from the sound of it, but don't let the name fool you: Nob Hill has a number of budget-friendly surprises. It's easy to dismiss the upscale address, but you can call this 'hood home for a few nights without breaking the bank. This well-located (and yes, opulent) area just blocks from Union Square offers a few bargain properties interspersed among the city's finest. Grant Hotel - This two-star property is just the ticket if clean and cheap are your top requirements. Originally built in 1910, Grant is one of the oldest and most historic hotels in the city. Although it has been recently renovated, it also remains one of the most austere. Luxury it's not, nor is it air-conditioned. However, who can argue with this location? If you don't balk at tiny and simple, you'll love the price; basic but adequate rooms start at $85 per night, and the website encourages guests to "call or e-mail for possible discounts". The rates here are tough to beat in this town, and complimentary breakfast and free lobby Wi-Fi are included to boot. Hotel Vertigo - Yes, that Vertigo, as in Hitchcock's thriller of the same name. If you're not familiar with the film, you can catch it on endless loop in the lobby of this 102-room, stylish boutique property that celebrates its storied past. The hotel's theme is decidedly funky; the vibe sits squarely between throwback and modern, with signature vibrant orange splashes throughout in chairs, fabrics, and wall coverings. Again, there's no air-conditioning, but the location is desirable since it's just blocks from everywhere you'd want to be. Rates start around $140 per night. AAA and AARP/Senior rates are available as well. 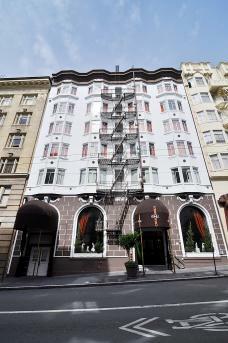 Hotel Carlton - This homey, pet-friendly eco-hotel is conveniently located on the edge of Nob Hill, just steps from the tourist area of Union Square. Part of the Joie de Vivre Hotels brand, Hotel Carlton boasts an eclectic vibe, brimming with thoughtful touches such as a lobby fireplace, a library of books for guests to use, and high thread counts in the rooms, not to mention walk-in closets, HDTVs, local organic coffee, and luxury bath products you just don't normally see at this price point. The decor's warm tones have a calming effect on guests, as does the nightly free wine reception held in the hotel's lobby. Rates start around $125 per night. Location, location, location! The place to be for all things tourist, Union Square tightly pairs hotels and shoppers, which can be the right combination for a smart deal. Yes, you'll find Tiffany's here, along with Ghirardelli and the Apple Store. High-end stores may mask the budget appeal, but there is inexpensive lodging to be found in the heart of it all. Try to book a room on an upper level floor for sweeping city views! Serrano Hotel - It is amazing to find this beauty of a high-rise on the bargain list, but the property's rates are surprisingly affordable. The guest rooms are both well-appointed and decently sized, which is a rarity in this neighborhood at this price. The standard base rooms start at 260 square-feet and feature high ceilings. Luxury amenities, including high-end bath products and bathrobes, continue to surprise. Free Wi-Fi, umbrellas, and a 24/7 fitness center round out the perks. 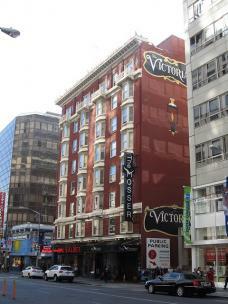 Location goes without saying; the hotel is just two blocks from the Powell Street cable car. Rates start at $179 per night, which is a steal for this level of quality. 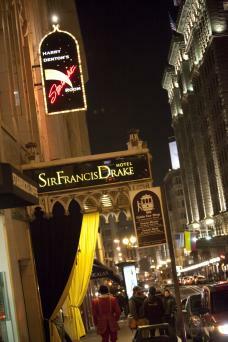 Sir Francis Drake - Now part of the Kimpton Hotel chain, this classic 1920s landmark feels more like royalty than economy. With over 400 beautifully designed rooms, this boutique property is the largest on this list. Yes, the rooms are teeny, and the bathrooms are even cozier. However, what it lacks in space, it makes up for in style. Think jewel-tone charm and richly furnished surroundings. Guests enjoy free Wi-Fi and a fitness center, plus less common offerings such as yoga mats, in-room spa treatments, and a nightly wine reception. Luxury touches include uniformed doormen reminiscent of another era, and pricing from days gone by as well. Rates start at an unheard of $149 per night. White Swan Inn - This 26-room B&B is a lovely respite from the bustle of Union Square. Its English countryside motif, replete with vintage floral wallpaper, somewhat stands out in California. However, the property enjoys a repeat following for its top-notch service and maintains the number ten spot on TripAdvisor's ranks for all of San Francisco. Comfortable and warm, your dollar goes far here. All rooms feature a sitting area, private bath and fireplace, and they sleep at least three people (the two- room Abbey Suite sleeps four). This traditional inn has free Wi-Fi and flat-screen TVs, in addition to free breakfast, afternoon cookies, evening wine, and more. Rates begin at $160 per night. These are a few examples of the many great places to stay in San Francisco, selected specifically to minimize the impact on your wallet. Selecting bargain accommodations to keep your lodging expenses to a minimum is a great way to make your money go far in the City by the Bay.